. - Home Collection Cookie Pan An essential gets a stylish update in this cookie pan from Ayesha Curry's Home Collection. The bakeware is dishwasher safe and durable. Anolon - Bakeware Nonstick 10 x 15 Cookie Pan Carbon steel construction and a nonstick exterior help everything from jelly rolls to biscuits bake evenly on this 10 x 15 cookie pan. The Anolon Bakeware pan has a nonstick exterior too making cleanup a breeze.
. - Usa Pan The Usa Pan 14 Pizza Pan is a sturdy commercial grade pan designed to distribute heat evenly to make the perfect crispy pizza crust. The 14 Pizza Pan surface is coated with Americoat. Trudeau - Silicone Loaf Pan Bake a bigger loaf of artisan bread or meatloaf for a family in this pan from Trudeau made of silicone reinforced with steel for easy handling. Trudeau - 24 Count Mini Muffin Pan Coral Perfect for bite-size brownies or savory nibbles this mini muffin pan from Trudeau features the easy food release of silicone supported by steel for stability. Oxo - Precision Batter Dispenser Pancakes crepes and more are perfectly proportioned with this batter dispenser from Oxo featuring a four-cup capacity and an easy-squeeze handle for precision and control. Martha Stewart - Culinary Science by Martha Stewart Collection Muff Ideal for muffins and cupcakes this versatile steel Culinary Science 12-count muffin pan by Martha Stewart Collection has many other culinary uses. Use it to bake individual portions of pie quiche meatloaf and other dishes. Anolon - Advanced 12-Cup Covered Muffin Pan Bake moist applesauce muffins for breakfast or rich cupcakes for a party with this non-stick muffin pan from Anolon Advanced crafted from heavy-gauge steel with a non-stick coating for lasting performance. Anolon - SureGrip 6-Pc. Utensil Set Prepare with ease and serve with style with this SureGrip utensil set from Anolon. The six pieces are uniquely designed to hit every cranny of the cooking pan and they're safe for non-stick cookware. Martha Stewart - Smiley Face Pancake Pan, Created for Macy's Start the day on a fun and yummy note with this Martha Stewart pancake pan featuring seven smiley faces that immediately lighten the mood.
. - Home Collection 3-Pc. Bakeware Set High-quality non-stick surfaces bring lasting performance to this bakeware set from Ayesha Curry. Part of her Home Collection the pans are in heavy-duty stainless steel with extended edges for easy handling. Nordicware - Pine Forest Bundt Pan Create a snowy vista or a decorated evergreen ring with this pine forest bundt pan from Nordic Ware in durable aluminum for lasting performance.
. - Home Collection 3-Pc. Bakeware Set Heavy-duty stainless steel brings lasting performance to this baking set from Ayesha Curry's Home Collection. The two pans feature extended edges for easy handling and non-stick surfaces for reliable results. Oxo - Half-Sheet Silicone Baking Mat & Pan Cut down on cleanup time with this set from Oxo a half-sheet pan and silicone mat to line it. 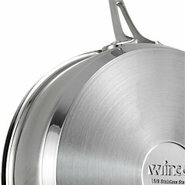 The pan is in durable steel with a non-stick coating for easy food release. Anolon - Advanced 5 Piece Bakeware Set Everything you need for the basics of baking in one heavyweight carbon steel set with a nonstick surface that eliminates the need to grease up pans before use making clean up a cinch. Limited lifetime warranty.
. - The Rock Lasagna Pan, 10 x 13 The Rock rectangular baking pan 10 x 13 x 2.5 Mfg 060735-003-0000 with riveted stainless steel handles non-stick surface never warps 10 year warranty dishwasher safe. Rachael Ray - Yum-o! 10-Pc. Oven Lovin' Non-Stick Bakeware Set Performance bakeware with a stylish look this 10-piece set from Rachael Roy is in heavy-gauge steel for durability. Part of the Yum-o! collection the pans' non-stick interiors make cooking and clean-up a breeze.